Entering the final weekend of Hockey East competition, Boston College is sitting pretty with a two-point advantage over second place Providence College, but inside Hockey East is about the only place BC is comfortable. It’s also why the league only has two teams inside the top 16 of the PairWise ranking. The PairWise — the mathematical formula used to predict the teams playing in the NCAA tournament — puts a lot of weight on not just overall record, but on who you beat and where. Having a strong non-conference record is vital to a teams’ PairWise ranking. With that being said, the Eagles have about the worst non-conference record you can imagine at 0-7-3 on the year. Not only does that tank their PWR, but it does the league no favors either. The first place team is supposed to be highly ranked in the PWR and carry the conference. Across the board — excluding Atlantic Hockey, which rarely ever has a team in the top 16 — all of the first place teams in the ECAC, Big Ten, NCHC and WCHA conferences are within the top 16 of the PWR. BC? No. 19 in the PairWise. The Eagles are looking at the very real possibility of having to win the Hockey East tournament to pick up an automatic bid into the NCAA tournament. In fact, that is the only way BC will get in. Using College Hockey News’ PairWise Probability Matrix, the Eagles have just a five percent chance of getting an at-large bid. Not ideal for the probable regular season Hockey East champion. On those same lines, it does the league no favors as a whole. For instance, since BC is ranked so low in the PWR, teams that beat BC don’t get the boost they normally would in the PWR from beating a first-place team. That’s what happens when you haven’t won a non-conference game since Barack Obama was the president of the United States. That’s right, the last out of conference game the Eagles won was on Nov. 13, 2016 against Arizona State University. Who was the last team to finish first in its league and fail to make the NCAA tournament in the same year? Oh yes, that would be BC just last year. The Eagles, along with Boston University and the University of Massachusetts Lowell all finished in a three-way tie for first place at the end of the 2016-17 regular season. 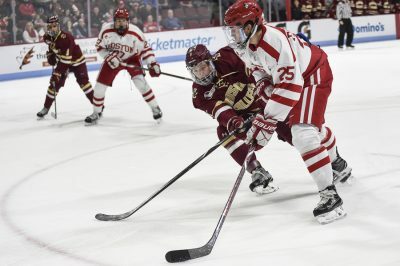 BU and Lowell both easily qualified for the national tournament, while BC lost to the River Hawks in the Hockey East championship game and saw its season come to a close. Is all hope lost for Hockey East? Well, as of right now, Northeastern University and Providence both have north of an 80 percent chance to make the big dance. Hockey East averages 3.3 bids a year, and has had no less than three since 2008 when BC and the University of New Hampshire were the only pair of Hockey East teams to qualify. BU is on the outside looking in as well. The Terriers sit at No. 20 in the PWR and only have a two percent chance of getting an at-large bid. Clearly, it’s not just a BC problem. Hockey East as a whole did the league no favors this year. Hockey East schools went 0-10-2 against the Big Ten and the WCHA, not to mention just 7-14-1 against the NCHC. 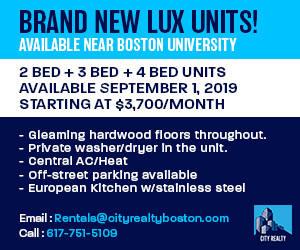 You want to know why Hockey East is going to only qualify two at-large teams? Look no further than that stat. In total, Hockey East actually has a winning record “against the rest” as it is called, but that is only because the league is 12-4-2 against Atlantic Hockey. In typical Atlantic Hockey fashion, the league doesn’t have a team ranked higher than No. 26 Mercyhurst University in the PWR. Eastern college hockey’s futility is not just limited to Hockey East. The ECAC also has struggled. Second place Union College is almost in an identical spot as BU in the PairWise. Only Clarkson University and Cornell University appear to have locks on making the national tournament. In total, only four of the top 16 schools in the PWR are from the east. In this modern age of college hockey, struggling outside the league is just not an option. As each weekend passes and we get closer to tournament time, it looks more and more like we are destined for our first all west Frozen Four since 2011. That year, the University of Minnesota Duluth, University of Michigan, University of Notre Dame and University of North Dakota all advanced to St. Paul, which is ironically hosting this year’s Frozen Four as well.